The guitar is normally tuned EADGBe, meaning that the notes from lowest to the highest strings sound as the tones e, a, d, g, b and e (see picture). If you play guitar, you want your it to be tuned just like that (there are also alternate tunings, more about that later). How you do it and why the guitar tuned in this particular way, are questions this article is trying to answer. EADGBe is read from left to right as from the lowest (thickest) string to the highest (thinnest). The reason why the sixth string is written in small letters will be explained later. Now that you know which tone each string should sound like, you should tune the guitar thereafter. There are some methods to choose from. This is probably the easiest way, especially if you’re a beginner. Nowadays, it has become popular with small electronic tuners that you can attach directly on the guitar head without a cable between. The picture to the right shows an example of a tuner of that kind, Snark SN-5 Tuner . Some guitars have a built-in electronic tuner, commonly placed on the side of the body. 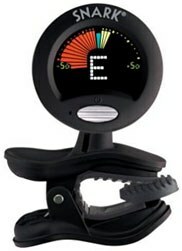 Using an electronic tuner is the simplest approach since you only have to pick a string and the tuner indicates which tone it is. You probably need to adjust the tuning pegs until the correct tone is matched. To get a higher note, turn the pegs away from yourself and to get a lower note, turn the pegs towards you (assuming you have the guitar in your knee or in front of you). For example, if the display on the electronic tuner indicates D# you should turn the peg away from you (counterclockwise) to reach E.
This can be done by playing on specific strings, for example the so-called 5th Fret Guitar Tuning Method, and get the right tune by comparing the sounds. The method can be quite difficult if you’re a beginner, but you can watch this video and listen to the notes and at the same time play the strings on your guitar and turn the tuning pegs until you get a similar sound. A third way is to compare the tones from the guitar strings to references on the piano keyboard. The image below illustrates the relationships. The numbers indicate which octave on the keyboard the tone should be played. E2 will therefore be the e tone on the second octave and so on. So why are e, a, d, g, b and e chosen to be standard for this instrument? It is plainly because it is suitable in many ways. It makes it easier to play chords in the most common keys and it is also beneficial for playing scales. In other words, the cause for the arrangement of the tuning is pragmatic. As you may notice, it is easy to play open chords like C, D, E, G, A, but to find open shapes near the nut for chords like C#, D#, F#, G# and A# is much harder. The names, or letters, of the guitar strings may confuse some. For instance, why is the second e written in small letters when the rest is written as capitals? This is done to distinguish them: the second e (the highest string) is two octaves above the other. This means that e on the 2nd octave, for example, has more bass sound than e on the 4th octave. The slight asymmetry is once again because of pragmatic reasons in the sense of playability. It is not clearly known when the first six-stringed guitar was built, but according to most sources it happened in the late 18th century. Sometime in the beginning of the next century, the tuning based on EADGBe was established. Over the years, many alternative tunings have emerged. Two of the more popular is Open D tuning and Open G tuning. As said earlier, the standard tuning is used because it generally offers most playability, but the use of alternate tunings is for creative reasons and have served many experimental guitarists. 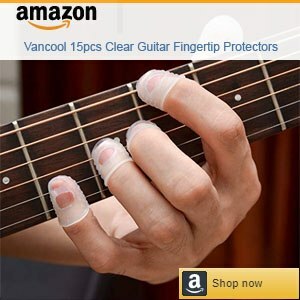 In some particular cases, the alternatives can be preferred, open tunings are for example more suitable for playing slide guitar than the standard. Sometimes guitarist chooses to tune down the strings one (a half step) or two steps (a whole step) in order to change the sound some – it gets somewhat mellow – and, perhaps, for the reason to lose the strings a little to make it easier to play. It can also be easier to sing in higher register with a Eb Ab Db Gb Bb Eb tuning. For the beginner, the standard EADGBe tuning isn't necessary the most convenient. An alternate tuning like EADGBD could be easier to handle. For example, the G chord could be played with two instead of three fingers, which also is the case with some other common chords. Also, the Bm and F chord that is often played with bar chords in standard tunings could be played by shapes in open positions. However, since most songs and most information available about playing guitar is generally based on the standard EADGBe, the primarily recommendation is after all to use this tuning as a beginner.